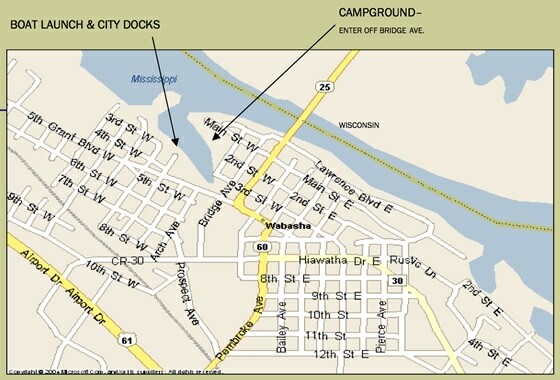 The Wabasha Municipal Campground is located near the upper marina on the Mississippi River. It is close to the downtown area and within walking distance of dining, shopping and the National Eagle Center. There is a boat launch nearby with 4 launch ramps and plenty of trailer parking. While most of the campground is leased seasonally there are 2 first come first serve spots for over-nite camping. There is also a bathhouse with shower facilities. 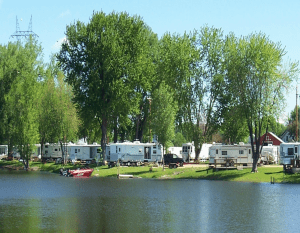 All campsites have full water/sewer and electric hook-ups. Cable and phone service is also available for seasonal sites only. There are only two sites (20-21) available for overnite camping on a first-come, first-serve basis. Payment is made by completing a payment envelope and dropping it in the box provided.